Posted on 4, March 2016 by EuropaWire PR Editors | This entry was posted in Automotive, Germany, Marketing and tagged The Mercedes-Benz SL. Bookmark the permalink. STUTTGART, 04-Mar-2016 — /EuropaWire/ — The Mercedes-Benz SL has enjoyed iconic sports car status for more than six decades now.The latest generation is to be launched in April 2016. It is all set to transport the unique tradition of elegant sportiness into the future. The roots of the Mercedes-Benz SL are in motor racing. After the Second World War, Mercedes-Benz developed the 300 SL racing sports car (W 194, 170 hp/125 kW). This began competing in 1952 and duly dominated the season, claiming second and fourth place in the Mille Miglia, a one-two-three win in the sports car race in Bern, a one-two win in the Le Mans 24-hour race, the first four places in the sports car race at the Nürburgring and a one-two win in the Carrera Panamericana Mexico – an illustrious record indeed. A characteristic feature of the Coupé was its gullwing doors – a direct consequence of the innovative space frame: they were cut deep into the roof, opening upwards to present a spectacle reminiscent of spread wings, which prompted the Americans to refer to the car as the “Gullwing”, while the French opted for “Papillon” (butterfly). 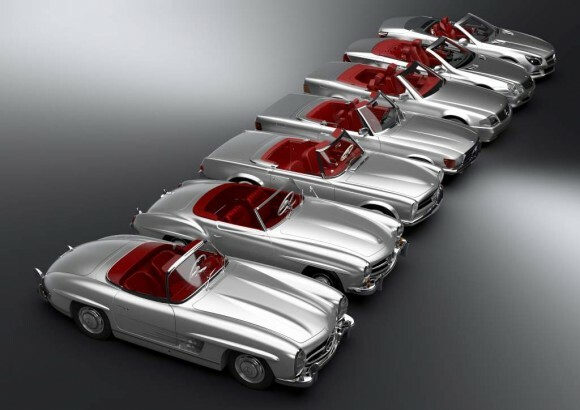 Recognising the car’s market potential, in 1954 Mercedes-Benz presented two series production SLs. The 300 SL (W 198, 1954 to 1957) with an output of 215 hp (158 kW) would be categorised as a super sports car today – the “Gullwing” Coupé won over experts and the public alike. While the technical concept and key components derived from the competition vehicle, the W 198 boasted beautiful body lines and an even more powerful engine with efficiency-enhancing direct petrol injection. This made it unique among the era’s series production sports cars. The 300 SL quickly became an automotive icon of the 1950s, winning major races along the way. In 1957 the Gullwing Coupé was succeeded by the 300 SL Roadster (W 198, 1957 to 1963). Both versions were absolute enthusiasts’ cars from the outset and are among the most sought-after and highest-priced classic vehicles today. The 190 SL (W 121, 1955 to 1963) was presented together with the 300 SL “Gullwing” as a perfect addition to the portfolio: the body was closely related to that of the Gullwing, but designed as a two-seater convertible with a lowerable soft top. The 190 SL (105 hp/77 kW) was specifically designed as a sporty yet comfortable touring vehicle. The combination of sportiness and comfort became an innate part of the all-encompassing qualities of all subsequent SLs. The Mercedes-Benz 230 SL replaced the 190 SL and 300 SL models in 1963.Its exterior featured clear, straight lines and the distinctive SL face with the large centrally positioned Mercedes star. It came to be known as the “Pagoda” by virtue of its hard top:with its high windows, the roof supported on only narrow pillars exuded a lightness of touch which, in conjunction with its inward curve, was reminiscent of Far Eastern temples. The Mercedes-Benz 230 SL (W 113, 1963 to 1971) was the first open-top vehicle to feature a safety body with rigid occupant cell and readily deformable front and rear segments – the so-called crumple zones – and was based on the Mercedes-Benz “Fin-Tail” saloons. It was followed by the Mercedes-Benz 250 SL in 1967 and the 280 SL in 1968. The SL R 107 series (1971 to 1989) took to the roads in the spring of 1971. For the first time in the history of the SL, this series was powered by eight-cylinder engines. Apart from their elegance and quality, the vehicles also exuded safety – the open-top two-seater’s crash performance was way ahead of its time. Although it was not originally planned to have such a long lifespan, this SL’s successful stint of 18 years marks an internal record which is unlikely to be broken: with the exception of the all-terrain vehicles of the G-Class, no other passenger car series has been produced over such a long period. At the 1989 Geneva International Motor Show, Mercedes-Benz presented the SL of the R 129 model series (1989 to 2001). The brand hit the mark once again with this vehicle: production capacities were soon exhausted, giving rise to waiting periods of several years. This SL set new standards in safety. The open-top vehicle performed sensationally in the stringent Mercedes-Benz frontal and rear impact crash tests. Integral elements of the concept were automatic, sensor-controlled rollbars which shot up into position within 0.3 seconds when the vehicle threatened to overturn and integral seats which were able to withstand forces far in excess of those which might occur in a collision. The most noticeable new feature of the next SL generation (R 230, 2001 to 2011) was the Vario roof. For the first time, this made it possible to have an open-top vehicle and a coupé in one – the transformation was completed within 16 seconds. The body design combined tradition and progress by way of striking details. The highlighted air openings in the front wings cited a typical feature of the 300 SL from the 1950s, for example. The narrow, wing-type profiles on these side air openings – which experts referred to as “fins” – were also reminiscent of the W 198. With a totally new safety concept, the SL of the R 230 model series clearly surpassed the standards which had applied up to this time. The list is long: apart from the body’s structural stability in any conceivable type of accident, other safety features included standard-specification electronic dynamic handling control systems such as Brake Assist (BAS), acceleration skid control (ASR) and the Electronic Stability Program ESP®. The Active Body Control suspension (ABC) was available for the first time on an SL. Further occupant protection items included two-stage airbags for driver and front passenger, head-thorax airbags in the doors, integral seats, high-performance emergency tensioning retractors, belt force limiters and the sensor-controlled rollbar, which also went into action when the Vario roof was closed. The most recent SL model series (R 231) has been available since 2012. The new generation featuring a technical and visual facelift is to be launched in April 2016, sporting an even more dynamic design. In evolving the radiator grille, for example, the designers have drawn inspiration from the SL’s earliest forebears. Powerful engines, the 9G-TRONIC automatic transmission, DYNAMIC SELECT with five transmission modes and Active Body Control with curve tilting function raise the roadster to a new level of driving comfort and sportiness. The soft top, which can now be operated at up to 40 km/h, and the automatic boot separator are additional amenities which further enhance the convenient user-friendliness of this luxury sports car.